Elounda Crete - Ελούντα is a collection of 7 coastal hamlets in the east of Crete, sitting on Elounda Bay on the north coast 12 km from Agios Nikolaos, with a charm of its own and beautiful beaches. On our visit, we thought this was one of the most beautiful bays in Crete. The scenery is magnificent, the beaches sandy, clean and protected and the vibe is modern, yet relaxed. 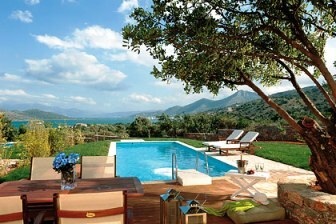 Elounda is lovely to visit, and makes a good base from which to explore eastern Crete. 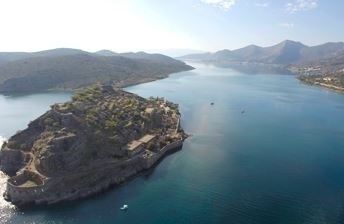 Spinalonga or the 'Island of Tears' is a place of mystery and history, being occupied by invading forces for centuries and at one time home to a leper outpost, a visit here is a fascinating journey of interwoven stories. This is the island from which the novel 'The Island' took its name, and captured the imagination of so many. 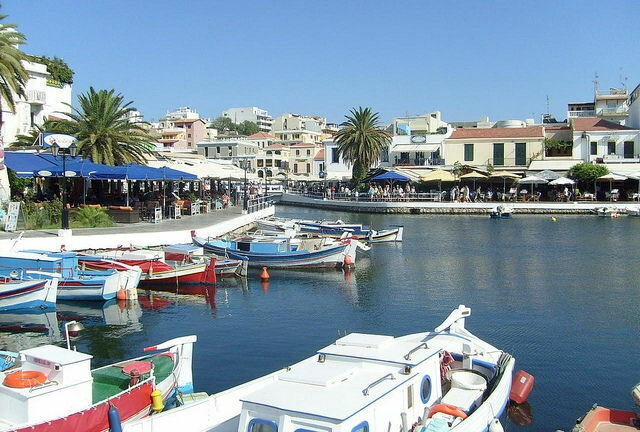 Visit from the nearby hamlet of Plaka, or from Elounda or Agios Nikolaos. 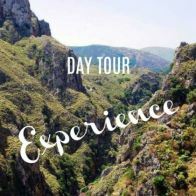 Ancient Kroustas Forest & Cretan Shepherd's Hut with Lunch - step into the real Crete for this 7 hour tour. Enjoy a long traditional lunch, visit a stone shepherd's hut, see stunning scenery and Kroustas Forest. 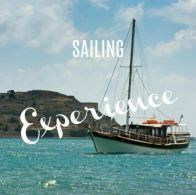 Kritsa Gorge to Plaka and Spinalonga with Meals - on this 8 hour tour you will hike, swim, eat and cruise and see the best the area has to offer. Make your own dolmades and taste authentic local olive oil. 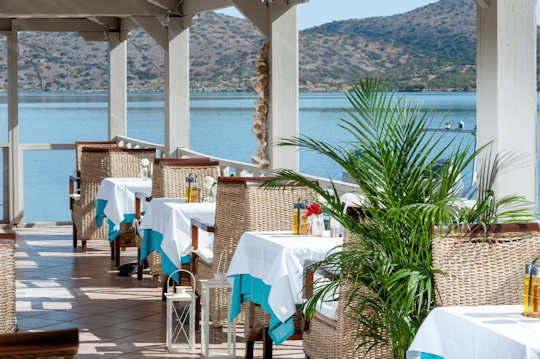 Blue Palace Resort & Spa - this is a five-star resort with magical views across the bay to Spinalonga Island. 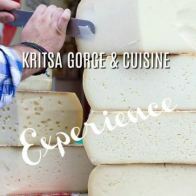 With the best that Crete has to offer, this is a world-class luxury experience. Guests can enjoy five different restaurants, many bars, the infinity pool and a private beach, all before visting the relaxing spa. Is this as good as it gets? Yes, perhaps it is! Almond Tree Villas - choose from a 5, 3 or 2 bedroom villa sleeping 10, 6 or 4 guests in comfort and tranquillity. With a fully equipped kitchen for self-catering, private balconies and a pool, this is a beautiful location yet 4 km from the beach, so it is best visited with a car. 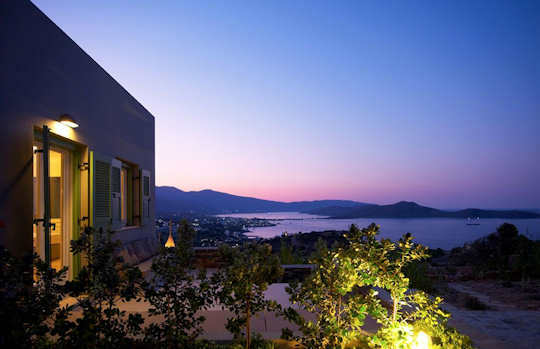 Ikaros Villa - situated on a hillside overlooking the Bay of Elounda, this magnificent modern villa sleeps16 people in 8 bedrooms and is perfect for your special event or family reunion holiday. 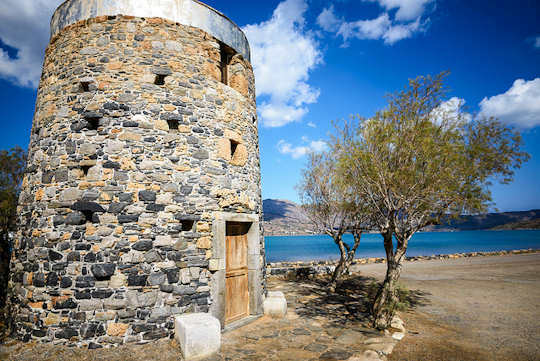 Elounda Crete - self-drive around the east of the island - discover the lesser known backroads and untouched beauty of this region. At the joining of the land from the main island of Crete over to the smaller island of Kolokytha is a thin isthmus. It is here that the ancient town of Olous can be detected, a sunken town from a different time. 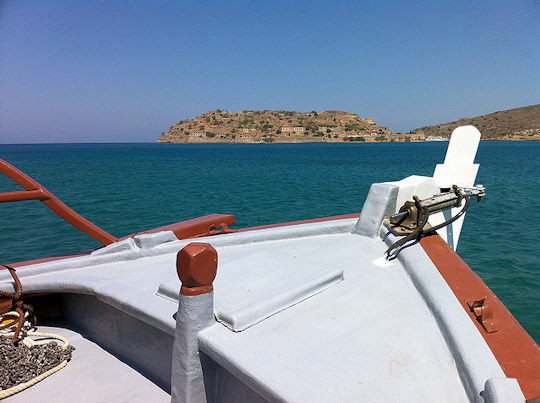 Explore the ruins on dry land or snorkel to see the remains, just 1.4 km south of Elounda Village. Here you will also find old windmills which are no longer used, sitting by the bay. 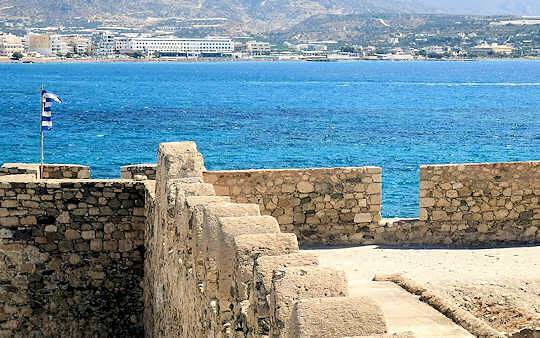 After a comfortable drive of 78 km to the east you will discover the bayside town of Sitia, with its pretty esplanade and many cafes and tavernas by the water, a beach and ruined fortress. Sitia is surrounded by olive groves and vineyards, as the olive oil here is very good, and the wine industry producing some of the best wines on Crete, do be sure to taste some of the whites and reds over lunch. Speaking of wine, the Toplou Monastery is one of the top winemakers in the region, you can visit this historic monastery, which is still active, and enjoy wine-tasting with local mezedes or tasting plates. This historic site is 15 km east of Sitia. Continuing for a further 9 km you will come to the exquisite Vai Palm Forest and Beach, at Itanos on the eastern tip of Crete. This is a very unusual combination for the Mediterranean and makes you feel like you are on a tropical island. This is a totally undeveloped beach of sand and pebbles with stunning clear azure waters. 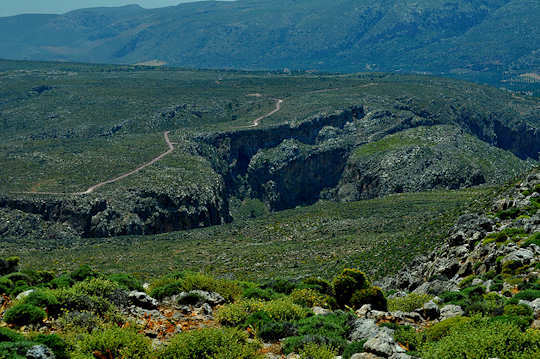 Take a different journey from Sitia to visit Zakros Gorge (above) and the sleepy seaside village of Kato Zakros. This is 44 km from Sitia and well worth the drive for the scenery. The gorge is also known as the 'Gorge of the Dead' due to the ancient burial caves to be found there. 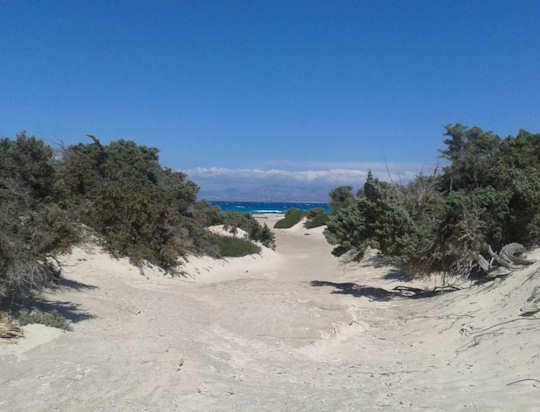 Start your 8 km walk at Ano Zakros and take a swim at the quiet beach of Kato Zakros afterwards. 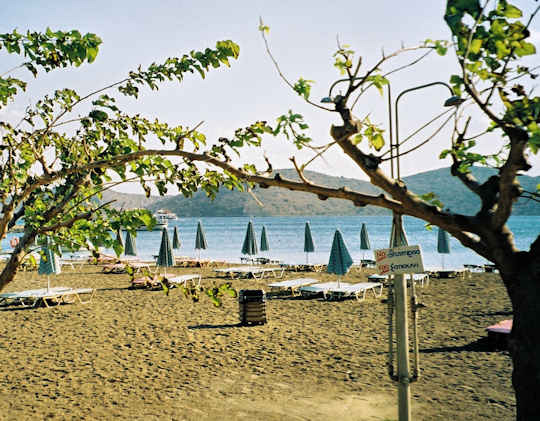 Or drive 44 km south from Elounda to discover the southern town of Ierapetra. This seaside town has a lovely esplanade, good seafood restaurants and beaches, near the port is the Kales Fortress, a Venetian ruin with views across the bay (above). Boats depart from its dock for the pristine Chrissi Island, a paradise of white sand and sparkling turquoise sea. Chrissi Island is a natural protected ecosystem, a tiny island located to the south of Ierapetra off the southern Cretan coast. Take a local day tour to visit the island and swim in its crystal clear waters, a perfect Greek summer experience. To get to Elounda Crete, fly direct in summer from Athens ATH to Heraklion HER or Sitia JSH with both Olympic and Aegean Airlines. 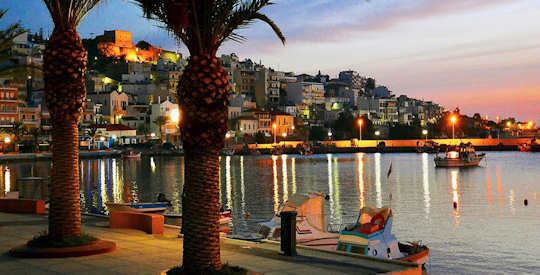 Drive east from Heraklion Airport for 70 km, leave 1.5 hours for this journey or stop on the way at Agios Nikolaos. Or drive west from Sitia Airport for 80 km, leave 1.5 hours for this journey, which also takes you through the regional capital Agios Nikolaos. There are frequent local buses by KTEL bus lines which are very convenient, buses depart from Bus Station A near the port in Heraklion. See booking options and information below.